A flip through this master course in bread baking from French-trained, California Culinary Academy instructor Kalanty might temper the most determined aspirant, but after digesting the basics (baker's percents, ingredients, add-ins, tools, techniques, and workplace setup and flow), readers will be primed to attempt Kalanty's "formulas" for a gamut of baked goods including baguettes, bagels, pizza, challah, babka, stollen, and cinnamon buns. 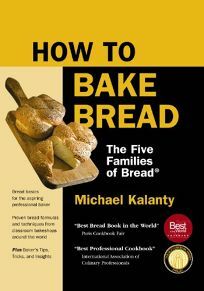 With his Five Families of Bread method—adapted from a 19th-century French culinary concept—Kalanty contends that readers can utilize similar techniques to make a variety of baked goods. A dynamic teacher, Kalanty adds spice with history and anecdotes in this engaging and practical volume. As readers turned bakers acquire skills like the "Degas and Fold," "Poker Chip Gesture," and visualization, Kalanty insists they will gain confidence to enter the fast track to creating boulangerie-quality breads.